XCAPI makes the change to IP technology for the users extremely simple and easy-to-use. Instead of hardware, there is software. Phone calls, landline or mobile, e-mail, voice mail or instant messaging, fax or conference calls and process applications - all in one interface, so you can work efficiently, saving time and money. XCAPI is always on the cutting edge – continuous development and the accompanying high compatibility with H.323 and SIP compatible terminals and gateways of all manufacturers distinguishes the software. A revised monthly Interoperability List always inform you about the current developments. Ready for dispatch and as fast as possible by the customer: In a very short time after the order you will receive all the necessary requirements to install XCAPI. The installation wizard will help you within a few minutes to make the XCAPI ready to use. Just try it! You are not determined by the number of used channels. XCAPI can grow with your company and your requirements. So you can flexibly increase when the requirements set by the market have changed. XCAPI makes it possible. Will we see each other in fabulous Las Vegas in July 2018? We are looking forward to the C4B partner event in the Jochen Schweizer Arena in Munich! Did anybody see where 2016 went? New XCAPI Product Partner: New CTI Solutions B.V.
We are pleased to announce our new XCAPI Product Partner New CTI Solutions. The Dutch company, based in Maassluis, was founded in 1999. New CTI Solutions offers a wide range of solutions - specifically tailored to the company's needs - for Unified Communications, customized SMS solutions, Fax, Voice, IVR and more. In order to take full advantage of the XCAPI Line Monitor in the future, we have produced a new video tutorial showing in detail all different kind of reporting capabilities and application possibilities. Take a look how you can work even more efficiently in future using the XCAPI Line Monitor. You are moving? With your XCAPI license file? 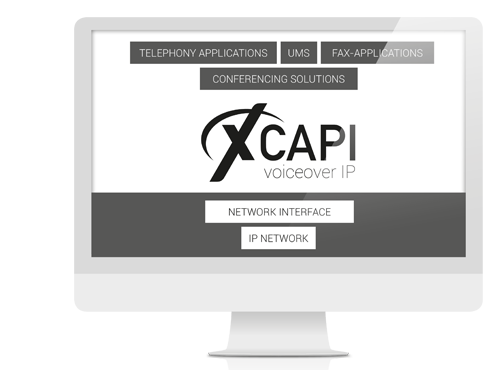 As middleware to fax phone, instant messaging, emailing or for conference calls XCAPI is the perfect link. Regardless of the company size or its requirements, XCAPI can meet all your needs on one unified user interface in order to improve clarity and user friendliness and to save time and nerves. And best of all: thanks to a set by XCAPI available CAPI interface is possible a fast, easy migration from ISDN to VoIP the highest quality with no modification to the existing application base. Unified Communications makes communication faster, more focused, clearer, more customer friendly and cost-effective!